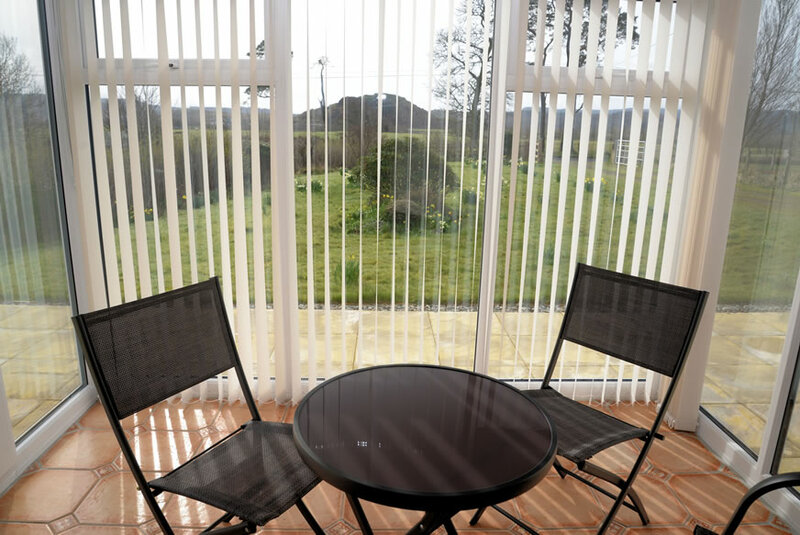 The accessible property is well equipped, creating that ‘home from home’ feeling. 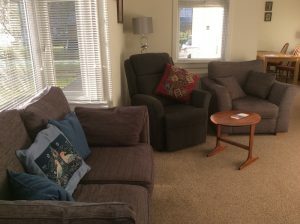 The living room is spacious and contains a wood burning stove, TV with BluRay DVD and a CD player. New this year – we have WiFi and BT TV with Netflix for your use. 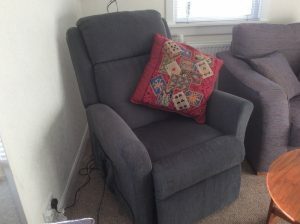 The living room also features a double sofa, matching chair and – also new this year – a double-motor riser-recliner chair. Adjacent to the living room is the dining room which has a table seating 4-5 people (which can also be extended to seat 6+ people). The modern well-equipped kitchen features all the essentials you will need during your stay. The property has two shower rooms. One is a wheel-in wet room, with two grab rails, and a stool in the shower area. There is a Freeway T80 tilt-in-space shower wheelchair with lidded commode. The wet room is equipped with an accessible basin and a raised toilet with a two drop-down support rails. The other shower room has a shower, basin and toilet. Please note this second bathroom is not accessible for a wheelchair user. There are three bedrooms in the property. The first has a super king-size double bed, which can also be made into two singles (please advise when booking.) The second bedroom comes equipped with an electric Theraposture profiling bed with two rails on each side which can be raised or lowered. There is also a battery powered Oxford Mini 140 hoist – guests must please bring their own sling. There is an additional single bed in this room. The third and final bedroom is a small room with a single bed, slightly narrower than a standard single (2’6”) but the normal length. A cot can also be provided. There is a mattress and a sheet for the cot, but please bring the bedding for your baby. Please advise well in advance if you require the cot. The conservatory boasts wonderful views of Dunadd Fort. 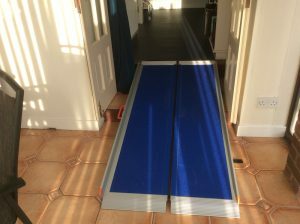 There are 2 shallow steps into the conservatory, and there is a folding suitcase ramp which can be put in place to enable a wheelchair user to go into the conservatory through the double doors that open into it from the house. The patio can also be accessed by a wheelchair user from the path at the front of the house.